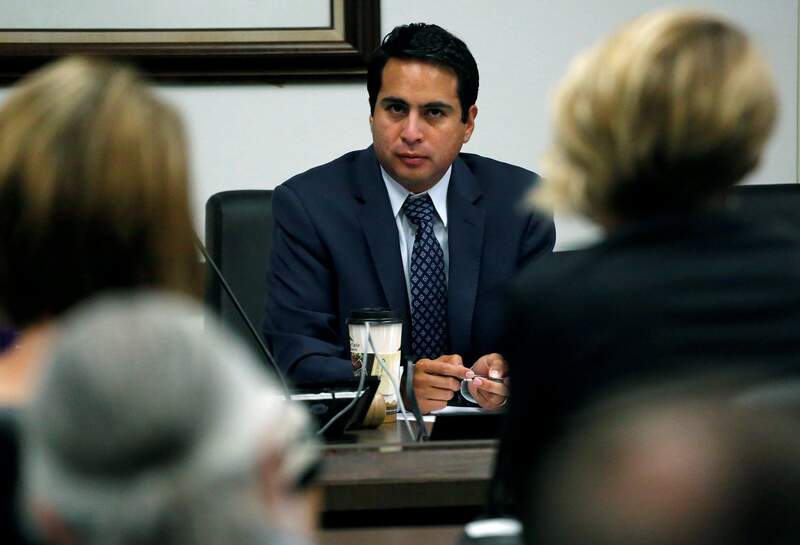 State Rep. Dan Pabon, D-Denver, hears testimony Wednesday during a hearing of the state House Marijuana Cost-Benefit Analysis Interim Committee at the state Capitol in Denver. A panel of state lawmakers voted 5-0 to endorse the addition of PTSD to Colorado’s 2000 medical pot law. The vote is a recommendation to the full Legislature, which resumes work in January. DENVER – Post-traumatic stress disorder would be eligible for medical marijuana treatment in Colorado under a proposed measure that was advanced Wednesday by a legislative panel. The interim committee sent the bill to the Legislative Council Committee on a 5-0 vote, though some lawmakers said they have concerns. The panel also advanced a handful of bills that aim to crack down on the black and gray marijuana markets in Colorado. Supporters of the bills say legalization has provided loopholes for illegal growing and selling. Lawmakers are considering prohibiting advertising for marijuana without a valid retail license after law enforcement reported Craigslist ads for marijuana from growers and distributors not licensed to sell. The Legislature may also consider enforcement grants and dollars to support education around eliminating the gray and black markets. But the panel stopped short of advancing a bill that would have allowed for bring-your-own-cannabis social clubs and tasting rooms inside dispensaries. That issue is likely to come up again when the Legislature convenes in January. The panel also opted not to advance a bill that would have further cracked down on loopholes that are being exploited, such as home-grow collectives, in which illegal distributors claim they are “assisting” with growing for friends and family, when they are really diverting marijuana to the black market. Similarly, the panel chose not to advance a bill that would have beefed up collecting data on impaired driving as it relates to marijuana. If the PTSD bill makes it past Legislative Council, then it would be favorably introduced at the start of the next legislative session, which would be a positive sign for the bill’s passage. Attempts to convince state health officials to add PTSD as a qualifying condition through rule-making failed in the past, so supporters – led largely by veterans – hope to convince lawmakers to support it. If they do, Colorado would join 18 other states and Washington, D.C., that allow cannabis for PTSD treatment. Montana voters will decide in November whether to make the same change. “We have enough problems going on in the VA without adding this,” said Greg Duran, an Air Force veteran and owner of cannabis testing lab The Good Lab. Duran spoke as the U.S. Department of Veterans Affairs Office of Inspector General released a report on an investigation into the Aurora VA hospital construction project. The report concluded that the project experienced significant cost overruns and schedule delays. “Cannabis is not the only answer, it’s a percentage of the answers,” Duran added. But the medical community remains unconvinced, which has derailed efforts in the past.